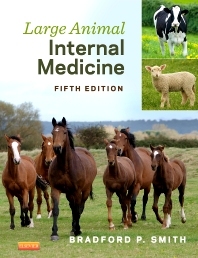 Large Animal Internal Medicine, 5th Edition features a problem-based approach to the diagnosis and management of disease in horses, cattle, sheep, and goats. It offers discussions of over 150 clinical signs and manifestations, as well as comprehensive coverage of laboratory and diagnostic testing. Thoroughly revised and updated content includes new vaccines and vaccination protocols; the most current laboratories for DNA, genetic, and PCR testing; and colostrum supplements and replacers. It’s everything you need to stay up to date with the latest information on preventing and treating disease in large animals. Discussions of over 150 clinical signs or manifestations of disease provide you with a problem-based approach to diagnosis based on what you observe and what laboratory tests reveal. More than 200 expert authors contribute information in their areas of expertise for the most current, authoritative information on each topic. Color plates accompanying Diseases of the Eye and Diseases of the Alimentary Tract chapters illustrate the clinical appearance of ophthalmologic conditions and endoscopic views of equine alimentary tract disorders. Causes of Presenting Signs boxes offer quick access to the common, less common, and uncommon diseases associated with manifestations or signs of disease. Causes of Abnormal Laboratory Values boxes highlight the possible interpretations of abnormalities in clinical chemistry, hematology, blood proteins, and clotting tests. An extensive list of useful references on a companion website, many linked to their original source on PubMed, enables you to continue research on specific topics of interest. Thorough and extensive index makes it easy to quickly locate key information.